The venerable superhero-themed MMO will be shutting down for good before the end of the year. "All good things must come to an end." Today, you might use that proverb to refer to the aged-but-well-liked superhero MMO, City of Heroes, and its developer, Paragon Studios, which will soon be closing its doors for good. 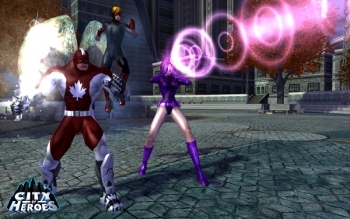 All City of Heroes billing, including the Paragon Market in-game store have been shut down, and preparations are being made to turn off the servers before the end of the year. No reason has yet been given for the game's closure. In a farewell post on the official City of Heroes site, Community Manager Andy Belford elaborated, "In a realignment of company focus and publishing support, NCsoft has made the decision to close Paragon Studios. Effective immediately, all development on City of Heroes will cease and we will begin preparations to sunset the world's first, and best, Super Hero MMORPG before the end of the year." This news will certainly come as a surprise to many players. Indeed, it may have been a surprise even to employees of the studio itself; a new powerset was released in the Paragon Market just ten days ago, and now can no longer even be purchased. While the farewell post urges players not to "dwell on the "how" or the "why"," there will no doubt be a lot of people wanting answers. An examination of NCsoft's IR (Investor Relations) report for August 2012 may reveal some clues to those answers, however. Visible on the thirteenth page of the report, it seems that sales related to City of Heroes have remained fairly constant - in fact, they increased very slightly over mid 2011 sales. At a glance, this does not seem particularly damning, but it should be considered that City of Heroes went through a free-to-play conversion over the later half of 2011, launching officially as City of Heroes: Freedom on September 13th, 2011. Undoubtedly, this conversion was intended to increase the game's profitability and longevity, and yet the revenue barely increased. With newer, bigger NCsoft titles either just arriving or on the horizon like Guild Wars 2 and Blade and Soul, it is - unfortunately - not inconceivable that NCsoft would decide to pull the plug. Whatever the true reasons for the game's closure, it's truly sad to see it come to an end in such a fashion. While it never achieved the runaway success of larger MMOs like World of Warcraft, it was well-received by critics and well-liked by fans, and it will be missed.